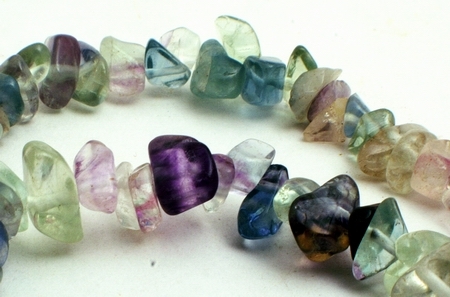 Price is per long 34-inch strand of these beautiful grade fluorite beads - largest measures about 10mm x 6mm x 5mm. The mineral fluorite is famous for its glassy luster and wide range of colors - from purple, blue, green, yellow, colorless, brown, pink, black and reddish orange. Named after the Latin word "To flow". Fluorite brings perceptiveness, peace and calm to a troubled mind. It's particularly useful in medication, because holding even a small piece in the hand brings a sense of inner peace. Those who choose this stone are likely to be artistic and creative, being able to earn money from their talent ?as well as self-critical with a fear of failure. Fluorite is considered to be the most powerful healing stone, especially for strengthening the bone tissue. Fluorite have been excavated from the ruins of Pompeii, but despite being a favorite with ancient civilizations, has been recently overlooked.